New York’s past and future jostle for position on the weed- and graffiti-strewn Bowery. A century after it became a byword for desperation, the wide boulevard on the city’s Lower East Side is undergoing a transformation. The homeless shelters and soup kitchens are still doing a brisk trade but they have been joined by modelling agencies, style bars and sleek hotels. Homeless men and women file in to the Bowery Mission to be fed and showered. Across the street, at number 220, visitors from every corner of the globe check in at the front desk of the Bowery House hotel which opened with little fanfare in July. Built in the 1920s to accommodate 200 people, The Prince Hotel as it was called then, was one of dozens of flophouses which sprang up on New York’s infamous Skid Row to give returning soldiers, down-and-outs and the down-on-their-luck a place to sleep. On the second floor of 220 Bowery, long-term residents still pay minimal rent to sleep in tiny stalls, six feet long by five feet wide. Directly above them, on the third and fourth floors, aspiring actors, creatives and international tourists pay $62 to $129 a night to sleep in renovated designer versions of the tiny flophouse cubicles, complete with Ralph Lauren towels and Egyptian cotton sheets. Guests have a choice of private rooms or dormitories. Their shared bathrooms have marble sinks, heated floors and expensive toiletries. 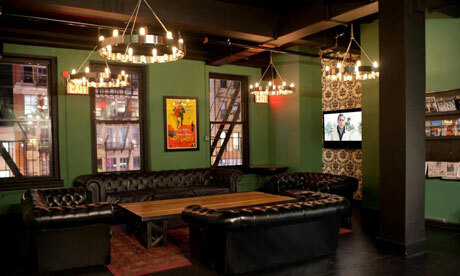 Film posters and black and white photographs from the 1920s and 30s on the walls hark back to the Bowery’s edgier days. The developers of the Bowery House have made a feature of the “flophouse aesthetic”, describing the hotel as “a living museum”. This entry was posted in Foreign Reporting, Travel & Reportage, Interviews, Features & Arts and tagged Bowery House Hotel, cheap Manhattan hotels, cheap places to stay New York, Claire Prentice, Claireprentice, flop house, hotel, Lower East Side, New York, The Lost Tribe of Coney Island. Bookmark the permalink.